CLEVELAND -- West Virginia freshman Daxter Miles Jr., who gained national renown Wednesday with his pregame assertion that No. 1 Kentuckywould end Thursday night with its first loss of the season, was far less verbose after the Wildcats' 78-39 blowout victory. "[Kentucky] played good -- played great," Miles said. "We didn't play to our best, and they played great." Miles repeated some variation of that statement in response to multiple questions Thursday night, relenting only when asked about departing seniors Juwan Staten and Gary Browne, and what the Mountaineers need to do to build on the success of their 2014-15 season. When asked about Kentucky's performance, his Wednesday comments, the attention they received, whether he thought the Wildcats were motivated by his comments and whether he was channelingSeattle Seahawks running back Marshawn Lynch, Miles stuck to the script. "They played great," Miles said. Miles was the target of Kentucky fans' ire for most of the Wildcats' blowout, including a sarcastic cheer when he decided not to attack on a fast-break opportunity late in the first half. He finished with zero points on 0-of-3 shooting from the field. Despite the outcome, junior forward Jonathan Holton said he respected Miles for his pregame confidence. "If he'd have came in and said, 'Oh, I don't know if we can win,' ... I guess they would have used that as he was scared," Holton said. "[Miles] is from Baltimore, Baltimore's like a tough neighborhood, that's how he was raised. He was raised like a winner. Deep down inside, he really wanted to win. He didn't do it for attention. I respect him a lot for saying what he said. He's just got heart, you know?" West Virginia coach Bob Huggins also didn't mind Miles' pregame comments. "You know what, honestly, I think that's a bunch of B.S.," Huggins said. "I think once you throw the ball up, you play. It was a freshman that said it, and I'm kind of happy he had some confidence. I'm kind of happy he wasn't hiding under a chair somewhere, you know? There's nothing wrong with having some confidence and wanting to go out and compete. They just were way better than we were." UK players disagreed. Following the game, Kentucky guard Devin Booker posted a photo of himself to Instagram in which he is being guarded by Miles, with Booker's shooting arm in a follow-through motion. He added the caption "#36andWon." Point guard Tyler Ulis told reporters Booker was making a "little play on words there." Booker later told reporters he was "already thinking" of the tweet before the game began. "I knew it was going to be like this," Ulis said. "We've been talking about it all day -- coming out all day and demolishing them because they were talking so much trash. Saying that we were going to be 36-1 -- we felt like that was nonsense. "Our whole plan was to crush their spirit. [To] beat them by 50 for disrespecting us." 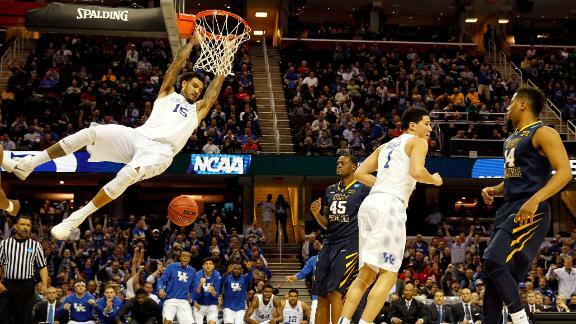 "It's tough to talk and not be able to back it up," forward Willie Cauley-Stein said. Kentucky (37-0) will face No. 3-seed Notre Dame in Saturday's Midwest Region final. Kentucky improved to 37-0 with a 39-point win over West Virginia and advanced to face Notre Dame in the Elite Eight. Jay Williams breaks down Kentucky's 39-point victory over West Virginia. Jeff Goodman discusses the dominant performance from Kentucky in the Sweet 16, and he looks ahead to the Elite Eight matchup against Notre Dame.